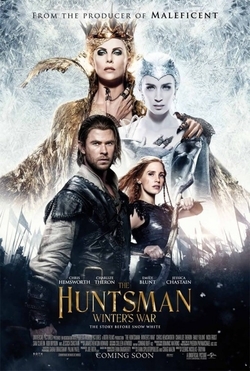 Seven years after escaping the Ice Queen Freya (Emily Blunt) and after helping to defeat the wicked Queen Ravenna (Charlize Theron), the huntsman Eric (Chris Hemsworth) is dispatched on a new quest when Ravenna’s magic mirror is stolen. Eric’s hunt to retrieve it brings him face-to-face with Sara (Jessica Chastain) – a wife he thought had died when he left Freya’s service. Snow White and the Huntsman (2012) was a beautiful parade of production design and cinematography that papered over an embarrassing lack of a quality screenplay. Solid eye candy can take a film quite far, however, particularly in a contemporary global film market that will eat up nearly any sufficiently expensive visual effects picture given enough marketing. Snow White managed to overcome fairly unimpressed critical reviews to gross close to US$400m worldwide, and those numbers seemed promising enough for Universal Pictures to attempt developing a sequel. At a very basic level one can see a half-decent sequel somewhere in The Huntsman. With the Snow White mythology essentially used up in the first film, The Huntsman neatly moves on to incorporate “The Snow Queen” as well. That is pretty much the film’s single good idea: every decision made from that point forth appears to have been the wrong one. Firstly, it is a Snow White sequel that lacks Snow White. The character is mentioned – someone is dispatched to give Eric some orders, and Freya talks of invading Snow’s kingdom immediately before the climax – but she is never seen and plays no significant role in the plot. There have been a few theories put out as to why Universal Pictures chose to spin off their male lead rather than produce a direct sequel. A more pertinent question is why the project continued to be developed even when the decision was made to abandon Kristen Stewart as the lead. This leaves Chris Hemsworth as the film’s central star, and he finds himself stuck playing a slightly more generic version of his popular character Thor in the Marvel Studios franchise. Stuck with a weakly drawn character and a Scottish accent he never quite manages to deliver, he is stuck unfairly in an unwinnable position for the entire film. The film loses a lot of supporting actors as well. One of the best elements of the preceding film was the exceptional talent hired to play the dwarves, including Ian McShane, Toby Jones, Eddie Marsan, the late Bob Hoskins, Ray Winstone and Nick Frost. Of that group only Frost returns, joined by an unconvincing Rob Brydon and a much more engaging Sheridan Smith. It is Smith who is the film’s one properly great addition, adding some much needed humour and heart to the quest narrative that forms the films first two acts. After eight male dwarfs in the original and twelve in Peter Jackson’s Hobbit trilogy, it is about time somebody cast a woman in one of these roles. Emily Blunt is wasted as Freya, with another underwritten role. Jessica Chastain fares similarly, and like Hemsworth struggles to maintain a dodgy Scottish accent as Eric’s former wife and fellow huntsman Sara. They are both sensational actors, but neither feels comfortable here. They are, to an extent, both victims of the film’s odd narrative structure. A lengthy but unnecessary prologue sequence establishes Eric and Sara’s romance, and their lives enslaved by Freya. The middle section of the film follows a well-worn and underwhelming quest to recover Ravenna’s magic mirror. The climax unexpectedly side-steps Freya’s vengeful crusade to rule all of the kingdoms of the world, and instead brings Ravenna back to life for a rote climax. Theron is good in her role, which always basically relied on her strong screen presence anyway, but she feels like a gatecrasher in somebody else’s film. The Huntsman also suffers from some fairly uninspiring and cheap-looking production design, which is a surprise given how great the design work was in Snow White. The film marks the directorial debut of visual effects artist Cedric Nicolas-Troyan. He was an Oscar-nominated visual effects supervisor and second unit director on Snow White, but he fails to make a sufficient progression to directing here. The Huntsman badly lacks atmosphere and tension, two things that could easily have helped to overcome the shortcomings of the screenplay. It ultimately makes the film something of a bore. This is a weak production that kills its franchise stone-dead. It is painfully generic, wastes its cast, and provides little in the way of iconic fantasy visuals or exciting action sequences. That said, I cannot imagine it damaging the reputations of its cast and crew for too long. Before long I suspect audiences will struggle to remember that it even exists.